Download "21 Reasons to join the CENTURY 21 System:"
2 5. CENTURY 21 Lead Management CENTURY 21 LeadRouter SM is a management tool that captures online inquiries from home buyers and sellers, converting data to voice, and instantly informs a CENTURY 21 real estate agent about the lead, enabling them to respond within minutes of receiving the request. In this day and age, a consumer needs to speak to someone immediately! Studies show that 74% of consumers go with the first agent that contacts them. 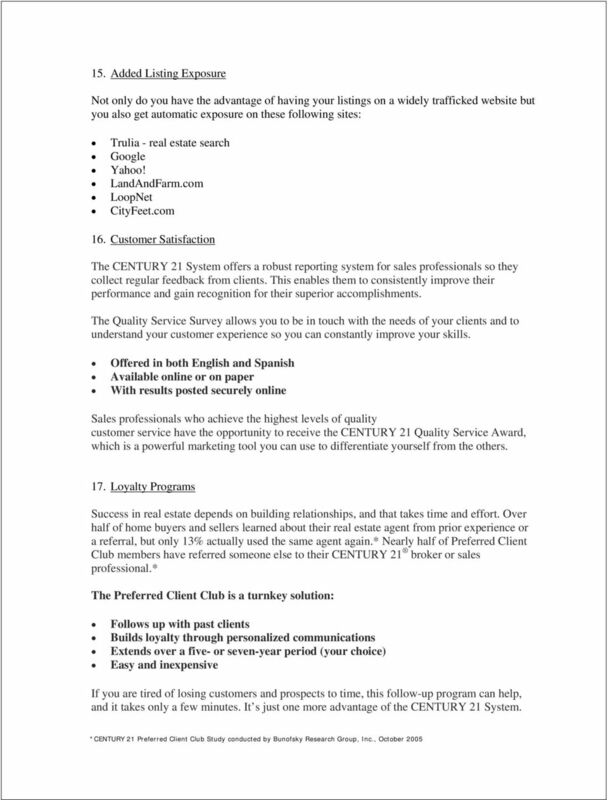 The CENTURY 21 LeadRouter system is a great way for all agents to receive leads in a timely manner so they can respond to the customer in a timely manner as well! 6. Century 21.com Averaging about 2 million visits a month, Century21.com provides tremendous exposure for your listings. Consumers will also find easy access to buying, selling and financial tools to help make their real estate dreams a reality. Additionally, all listings placed on Century21.com, are automatically listed on Google.com, trulia.com, landandfarm.com and yahoo.com at no additional cost. With the added visibility of your leads, you will be provided with a continued stream of opportunities. 7. CENTURY 21 Global Referral Network The CENTURY 21 Global Referral Network is an internet-based referral management tool that enables brokers to securely send and receive referrals 24 hours a day, 7 days a week. There are no activation fees, no software to purchase and you get free automatic upgrades. CGRN averages almost 400 referrals per month. Referral fees are negotiable and guaranteed. 8. 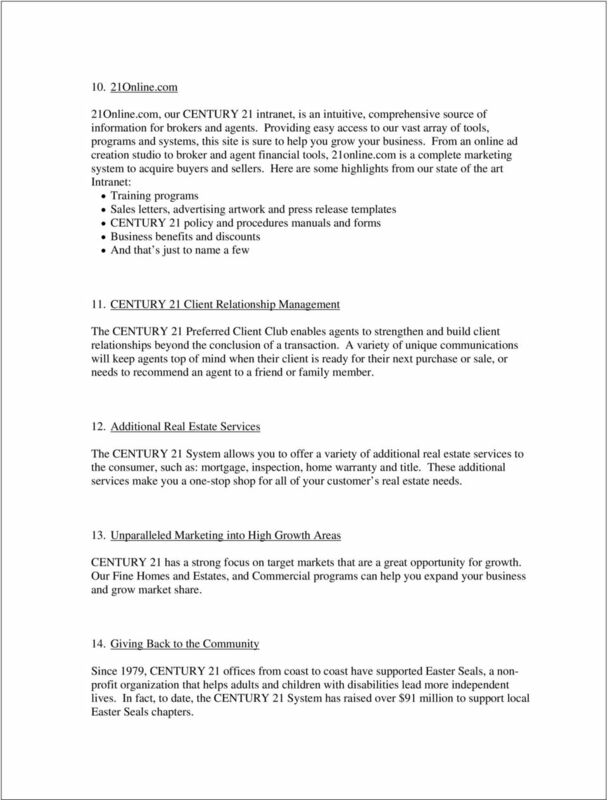 CENTURY 21 Business Benefits The CENTURY 21 Business Benefits program is a great way to save money on a variety of business related goods and services. 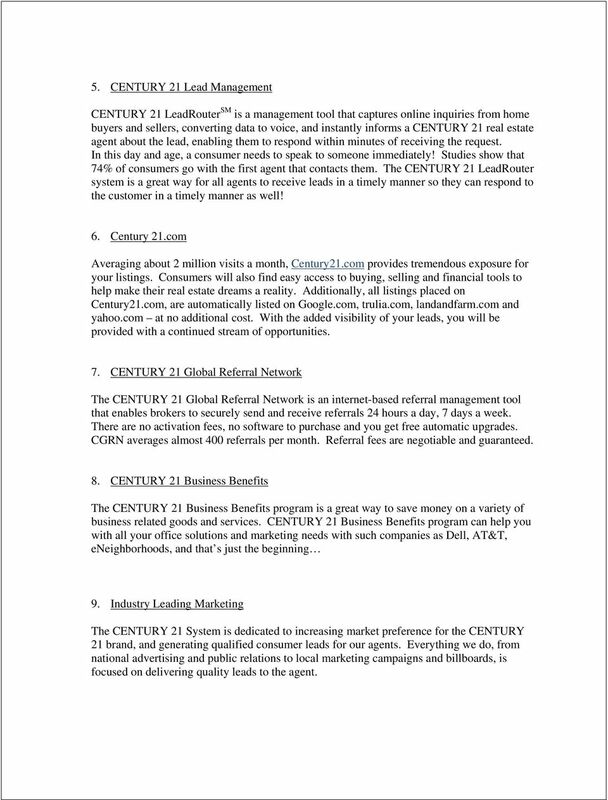 CENTURY 21 Business Benefits program can help you with all your office solutions and marketing needs with such companies as Dell, AT&T, eneighborhoods, and that s just the beginning 9. Industry Leading Marketing The CENTURY 21 System is dedicated to increasing market preference for the CENTURY 21 brand, and generating qualified consumer leads for our agents. Everything we do, from national advertising and public relations to local marketing campaigns and billboards, is focused on delivering quality leads to the agent. 3 10. 21Online.com 21Online.com, our CENTURY 21 intranet, is an intuitive, comprehensive source of information for brokers and agents. Providing easy access to our vast array of tools, programs and systems, this site is sure to help you grow your business. From an online ad creation studio to broker and agent financial tools, 21online.com is a complete marketing system to acquire buyers and sellers. 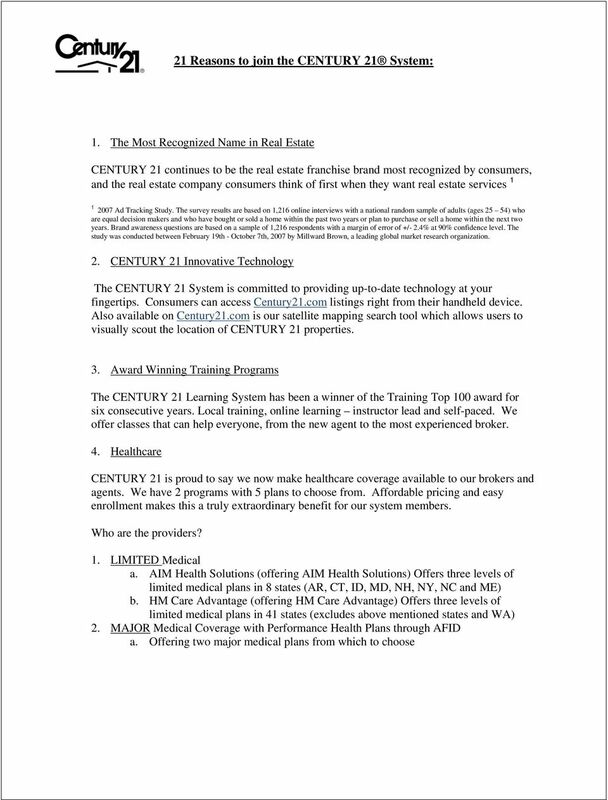 Here are some highlights from our state of the art Intranet: Training programs Sales letters, advertising artwork and press release templates CENTURY 21 policy and procedures manuals and forms Business benefits and discounts And that s just to name a few 11. CENTURY 21 Client Relationship Management The CENTURY 21 Preferred Client Club enables agents to strengthen and build client relationships beyond the conclusion of a transaction. A variety of unique communications will keep agents top of mind when their client is ready for their next purchase or sale, or needs to recommend an agent to a friend or family member. 12. Additional Real Estate Services The CENTURY 21 System allows you to offer a variety of additional real estate services to the consumer, such as: mortgage, inspection, home warranty and title. These additional services make you a one-stop shop for all of your customer s real estate needs. 13. Unparalleled Marketing into High Growth Areas CENTURY 21 has a strong focus on target markets that are a great opportunity for growth. Our Fine Homes and Estates, and Commercial programs can help you expand your business and grow market share. 14. Giving Back to the Community Since 1979, CENTURY 21 offices from coast to coast have supported Easter Seals, a nonprofit organization that helps adults and children with disabilities lead more independent lives. In fact, to date, the CENTURY 21 System has raised over $91 million to support local Easter Seals chapters. 5 18. Spot Runner Today, the average American household will watch 8 hours of TV per day. People will watch TV 50% more than they listen to the radio... and 10 times more than they read the news or surf the Internet. 82% of Americans say that TV is the most influential form of media available. TV is the most powerful advertising medium in America*. 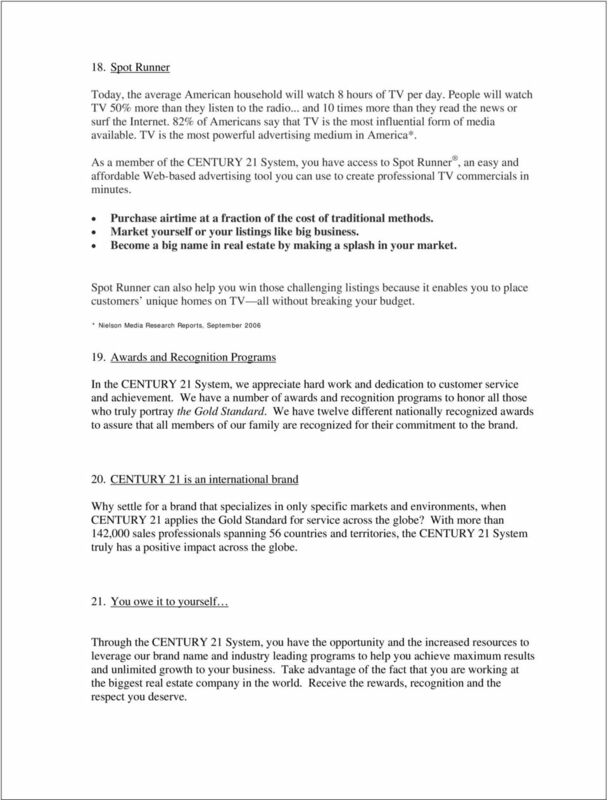 As a member of the CENTURY 21 System, you have access to Spot Runner, an easy and affordable Web-based advertising tool you can use to create professional TV commercials in minutes. Purchase airtime at a fraction of the cost of traditional methods. Market yourself or your listings like big business. Become a big name in real estate by making a splash in your market. Spot Runner can also help you win those challenging listings because it enables you to place customers unique homes on TV all without breaking your budget. * Nielson Media Research Reports, September Awards and Recognition Programs In the CENTURY 21 System, we appreciate hard work and dedication to customer service and achievement. We have a number of awards and recognition programs to honor all those who truly portray the Gold Standard. We have twelve different nationally recognized awards to assure that all members of our family are recognized for their commitment to the brand. 20. CENTURY 21 is an international brand Why settle for a brand that specializes in only specific markets and environments, when CENTURY 21 applies the Gold Standard for service across the globe? With more than 142,000 sales professionals spanning 56 countries and territories, the CENTURY 21 System truly has a positive impact across the globe. 21. You owe it to yourself Through the CENTURY 21 System, you have the opportunity and the increased resources to leverage our brand name and industry leading programs to help you achieve maximum results and unlimited growth to your business. Take advantage of the fact that you are working at the biggest real estate company in the world. Receive the rewards, recognition and the respect you deserve. Class 4: Option Trading - Part 1. 1. Assessing Risks and Rewards. Foundations of Stocks and Options Class 4: Option Trading - Part 1. Realtor benefits. Additional REALTOR Benefits include: Code of Ethics: Exceptional Customer Service Proudly Provided by FAR. WinForms.